Burnley lad Tom Anderson is a straightforward ‘kick it and head it’ defender, so it’s little surprise that in a complex week at the Proact he’s keeping things simple. The 23-year-old, on loan from the Clarets, prescribes hard work as the answer to his club’s woes on the pitch. Confronted with questions about the off-field crisis facing the Spireites, Anderson kept bringing it back to what he can do, the only thing he can do in such circumstances - put in the effort. 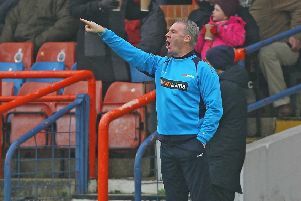 “Plenty of hard work,” he said when asked what could turn around the fortunes of a side winless in nine league outings. “Unfortunately, sometimes in football teams can go on runs. We’re on a poor run, but we keep doing what we’ve been doing and at some point it will change and we’ll climb up the league. Chesterfield are facing a cash-flow situation after the resignation of chairman Dave Allen. As a Burnley player, Anderson’s livelihood wouldn’t be impacted in quite the same way as any of those contracted to Chesterfield, should it come to the worst. But even so, there seems little point in worrying about things you can’t control. “The best thing we can do is try and do our job,” Anderson added. “We’ve got to go out on Saturday and put in a good performance. That’s all we can do. It could lift everyone. “If you get a few wins on the bounce, the confidence and the mood improves, although there’s nothing wrong with that at the minute. The player is still looking to find positives in what can’t be an easy time for anyone wearing a Chesterfield shirt. Chesterfield travel to Fleetwood Town today.